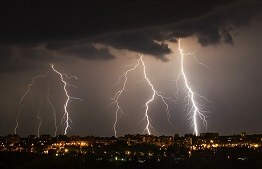 The origin of lightning could be explained by the mathematical research of CWI's Casper Rutjes and his colleagues. Picture: D. Kacs for Shutterstock. Until recently, it was not clear how lightning could start, as the electric fields in thunderclouds seemed to be too low. Casper Rutjes, PhD student at Centrum Wiskunde & Informatica (CWI) in Amsterdam, modelled and simulated the origin of lightning and ionizing radiation from storm clouds. By improving the models and simulations in several ways, he could explain the physics of these phenomena. On 15 March 2018 Rutjes defended his PhD thesis ‘Modeling high energy atmospheric physics and lightning inception’ at Eindhoven University of Technology. The results are not only important for lightning research but also for predicting short-out of high-voltage technology devices and for improving nuclear medicine models. Lightning is an electrical discharge and takes place in several phases. The final phase, which we all know, can be seen as a flash and heard as a thunder. In 2015, Rutjes and others discovered that the first phase, the origin of lightning, originated from the collaboration of ice crystals or hailstones and cosmic particles. This research was published in Physical Review Letters. Rutjes explains: "One thing we discovered was that starting a discharge from a surface, such as an ice crystal but also in technical equipment, is easier than just in air. The fundamental difference is that charge can actually build up near the surface, what researchers did not incorporate before. We showed, for instance, that a well-known criterion, the Raether-Meek criterion, which is used by many lightning researchers and in high-voltage technology, does not always apply near surfaces". For the second phase of lightning formation, when lightning channels are created, the CWI researchers predicted with models that lightning sometimes emits highly energy-rich radiation - so energetic that neutrons can even be detached from air molecules and that an afterglow of gamma radiation is generated. After these predictions this was observed in experiments from a Japanese team. The CWI result was published in 2017 in the Geophysical Research Letters. Rutjes also contributed to general method development. For example, he performed a large evaluation study, published in 2016 in the Geoscientific Model Development, where multiple high-energy particle models, also used in nuclear medicals, are benchmarked. He did his research in the CWI research group Multiscale Dynamics, headed by Prof. Ute Ebert. The research was funded by FOM (now NWO).